In a month or so, the rookery will be a hopping place. I hope to find myself back here, capturing all facets of breeding season. The above journal pages are in a Stillman and Birn 8.5 x 5.5 Alpha Series hardbound journal. 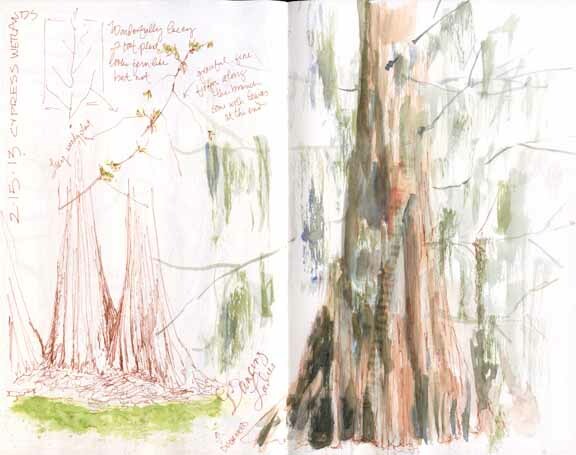 The tree on the right and the Spanish Moss were painted with a large round Pentel waterbrush. I find that if I load the brush with pigment, then touch the brush to a Bounty paper towel to get excess moisture off, I can achieve a dry brush effect. The pen sketching was done with a sepia colored 005 Micron pen. Nice job on the Spanish moss :) Looking forward to many trips to that rookery and many descriptions in your journal!